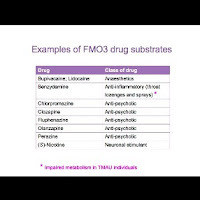 In this presentation, Dr. Shephard explains how a genetic mutation in FMO3 and/or CYP can produce a mutation in a drug metabolizing enzyme needed to clear certain drugs. As a consequence, there is very little detoxification and change in the drug, and thus, plasma concentration remains high. When taking the next dose, the same happens, resulting in the plasma concentration increasing over time without decreasing between each dose. This is potential for “adverse drug effects,” and in worst-case scenario, having too much drug, overdosing, and even death. In addition, Dr. Shephard explains how "Many drugs are metabolized by more than one enzyme" including CYPs (P450s), and she gives us a "very short list" as examples of some FMO3 drug substrates more commonly used, including anaesthetics, a variety of anti-inflammatory (throat lozenges and sprays), anti-psychotic, and neuronal stimulant, such as nicotine. She refers to a study that has proven the inability or compromised ability of people with TMAU to be metabolize Benzydamine, as stated in a previous post in this blog. So sufferers may ask themselves, what should we do with all this information? Should we make the decision to stop taking any or all medications prescribed by our physician, or should we take it upon ourselves to modify the dose as we see fit on our own volition? Absolutely not. 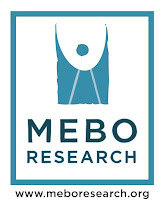 This is not what MEBO Research is recommending at all. Instead, MEBO is all about raising awareness, and it begins with a discussion of these concepts with one's physician. We need to have proactive discussions with out GPs about the topics Dr. Shephard brings up in this video, such as "Pharmacogenetics" and "Personalized Medicine." But most importantly, we need to take this information that Dr. Shephard gives us one step further. We need to listen to and study our bodies and to learn to discern and identify our adverse reactions to any given medication to then communicate it with our GPs. 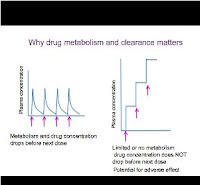 We need to clearly identify when we note the effects of a drug is consistently and abnormally increasing in intensity - when we feel that a medication is not "metabolizing and clearing" from our system resulting in adverse effects to the drug. One thing to remember is that many people have unpleasant effects from antipsychotics and antidepressants and this may not be due to changes in FMO3. ------ Ref: Dr. Shephard, 2012; note: short list. More names to come. Benzydamine (also known as Tantum Verde ), available as the hydrochloride, is a locally-acting nonsteroidal anti-inflammatory drug with local anaesthetic and analgesic properties for pain relief and anti-inflammatory treatment of inflammatory conditions of the mouth and throat. Clozapine (sold as Clozaril, Gen-Clozapine in Canada, Azaleptin, Leponex, Fazaclo, Froidir; Denzapine, Zaponex in the UK; Klozapol in Poland, Clopine in Australia and New Zealand) is an atypical antipsychotic medication used in the treatment of schizophrenia, and is also used off-label in the treatment of bipolar disorder. Fluphenazine is a typical antipsychotic drug used for the treatment of psychoses such as schizophrenia and acute manic phases of bipolar disorder. It belongs to the piperazine class of phenothiazines. Perazine (Taxilan) is a moderate-potency typical antipsychotic of the phenothiazine class. It is quite similar to chlorpromazine, and acts as a dopamine antagonist. *NOTE: Olanzapine is widely prescribed and is one of the top drugs of choice, as is Zyprexa, at this time. thienobenzodiazepines are being explored widely, and have been heralded as replacements for benzodiazepines due to less addiction. Since body and/or breath malodor sufferers may have deficient FMO3 and/or CYP metabolic conditions, instead of suggesting that one shy away from taking much needed medications, including the ones mentioned on this list, it is recommended to discuss the effects one has to these drugs with the prescribing doctor in an effort to help the physician tailor the drug dose to best work with the sufferer's metabolism and clearance performance, thus practicing "Personalized Medicine." Thanks to everyone who was a part of this presentation and this post.